Leading up to the Christmas time, many people begin putting up their Christmas lights. 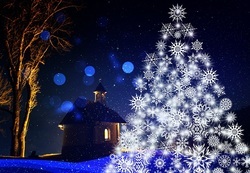 Both home and business owners alike deck their halls, porches, roofs, gardens, eaves, rooms, hedging, and trees with lights of all kinds – from pepper lights to icicle lights. Lights are something they look forward to every year and never miss a beat. But what if you are too busy to put them up yourself? Or what if you have so many Christmas lights to put up that you and your staff or friends are unable to do it? This is where we come in to assist. Our service of hanging Christmas lights has rescued many people over the years, so we can do the same for you. We service both residential and commercial properties. Wherever you want the lights to be installed, we can put them up for you. Roof Tops – Each year, a number of individuals and companies place wonderful lighting decorations on the top of their homes and offices. Some are creatively formed into reindeers pulling a sleigh or into a nativity scene. If you want your Christmas lights on your roof, we can do it. No matter the size or design, our “jolly” team will be more than happy to bring life to your roof this Christmas season. Eaves – If you are not into all the fuss of having a sleigh with reindeers on your roof but would rather something a lot simpler, we can make it happen. Our team can place Christmas lights all around the eaves of your home or up to the point you want them to stop. We can create simple designs that will make you say “wow” when you lay your eyes upon them, or you can let us know the design you want. 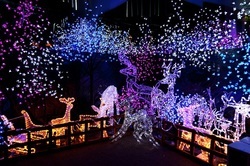 Rooms – Some people like having all the rooms in their home decorated with lights while others only want one or two decorated. No matter how many rooms there are in your home or office spaces in your complex, no matter their size, and no matter how many lights you want installed in any design, our team of professional interior designers will make those spaces glow and sparkle. Of course, rates are based on the size and number of rooms as well as the complexity of the lighting designs. 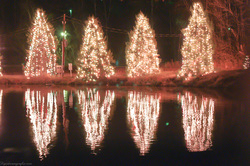 Trees – It is truly a wonderful sight to see trees decorated with Christmas lights. From wrapping only the bark with pepper lights to completely covering the tree with lights, it is a sight to behold. If you have trees that you want decorated, give us a call. We can decorate your tree(s) the way you want them to look. No tree is too big, no tree is too small for us to handle! Hedging – Properly groomed hedges are a sight for sore eyes and add value to any home. 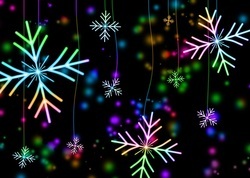 During the yuletide season, they look even better at nights when Christmas lights are placed on them. Many people who have hedging on their property try to do it themselves but never usually get it right. Are you one of those persons? If you are, then give us a call when you are ready to set up your Christmas lights. You can tell us what you want or you can allow our team to use their creative minds to light your hedging. We guarantee that you will be pleased with the results. Gardens – Make your garden come alive this Christmas by allowing us to install Christmas lights in the areas you want to light up. The lights can be installed along the edging to illuminate its outline, on the grass in any pattern you wish, along the walkway leading up to your property, or simply on the flowers in the garden. It’s your dream. Let us make it come true! How beautiful it is to see Boise come alive with Christmas lights. Let our team get your property ready for the yuletide season by hiring us to install the lights for you. If you wish, we can even do the entire house or office – windows, door jams, walkways, passages and corridors, walls, columns, you name it! Our charges are based on the location and size of the area where they are to be installed. We install all kinds of Christmas lights, so it is up to you to say what you want. Make your property the envy of your neighbors next time around by allowing us to “deck your halls” and wherever else you wish with stunningly beautiful Christmas lights.